Soulland and Nike Skateboarding are set to release their second collaboration, the “FRI.Day Part 0.2” that’s focused around the Nike SB Dunk model. 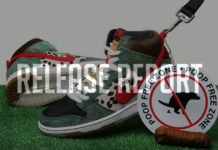 The two footwear models includes the Nike SB Dunk High and the Nike SB Dunk Low, both highlighted with playful details. There will also be matching apparel that includes t-shirts, hoodies, trousers and a jacket. Look for the Soulland x Nike SB Dunk “FRI.day Part 0.2” Collection to first release on December 8th at Soulland.com, with a wider release available on December 15th.